I recently read Jack Kerouac’s The Dharma Bums, and I’ve been in the mood for mountain climbing ever since. 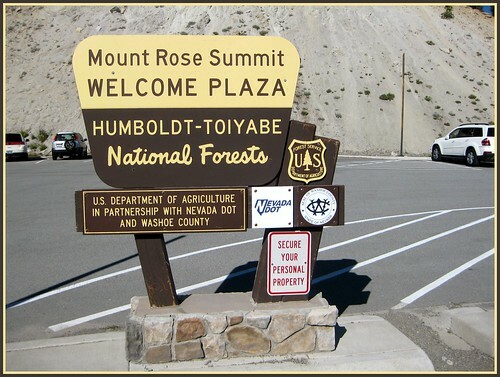 I climbed Mount Rose a few times in my youth, so I decided to make it my first big peak of the year. Something familiar and not terribly hard. I was also excited to try out the new trailhead and trail that cut 2 miles off the out-and-back to the peak. 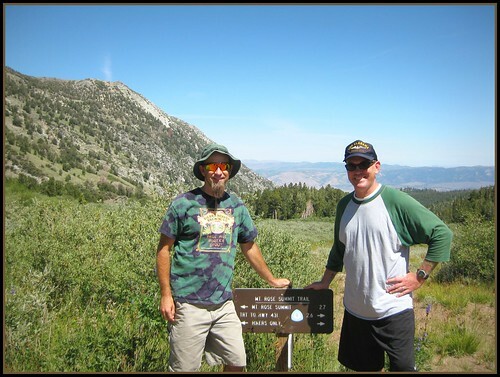 My friend James and I took Tuesday off and headed up to the Mount Rose Summit Trailhead bright and early. 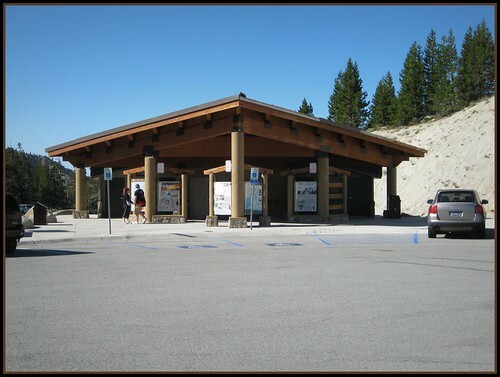 The trailhead is located at a nice new facility at the summit of the Mount Rose Highway, Highway 431. In addition to plenty of parking, there are clean bathrooms and many signs posted with information on the area. 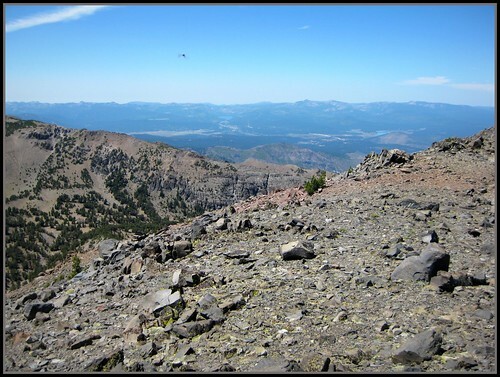 Being the tallest point in Washoe County, and one of the tallest peaks in the Carson Range, it’s easy to see Mount Rose from many locations. 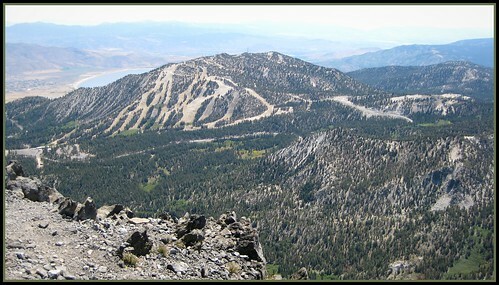 Due to the popularity of the Mount Rose Ski Resort, Slide Mountain is often mistaken for Mount Rose. 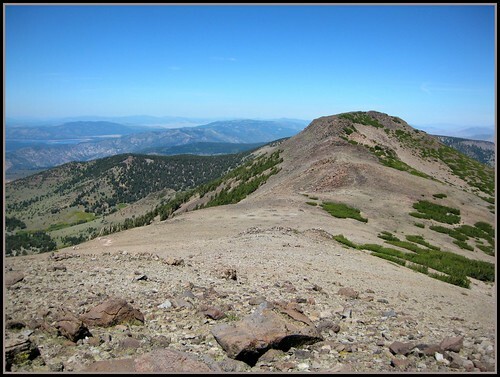 Mount rose is just to the north of Slide Mountain though, and is actually 1,000 feet taller. 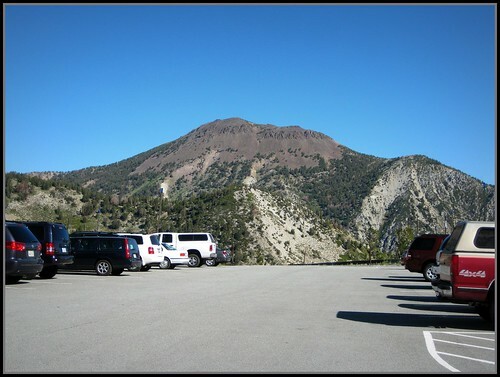 I could see the peak at several points during my drive to the trailhead. It kept getting closer, but still loomed above me. 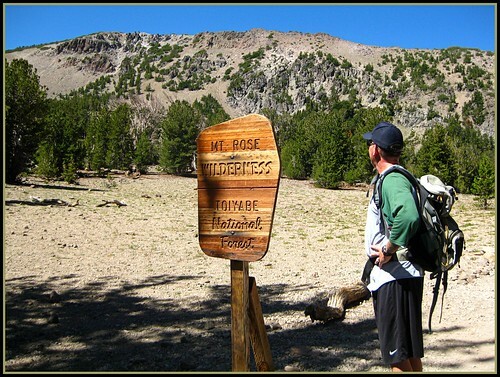 At 9:30 AM, we loaded up our gear, and made our way over to the trail directly to the southwest of the Welcome Center. 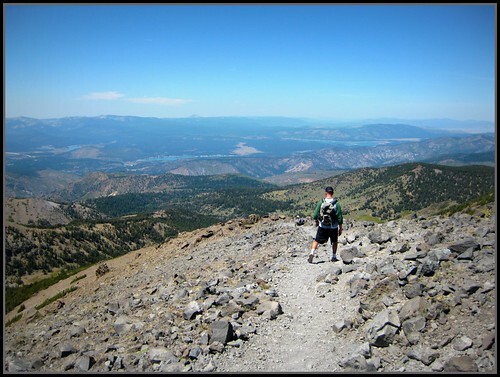 The trail heads up to the west for a bit, giving you fantastic views of the Mount Rose Meadows and Lake Tahoe. It’s not long before you start heading north into the trees below the east face of Tamarack Peak. This new section of trail gently follows the contour. 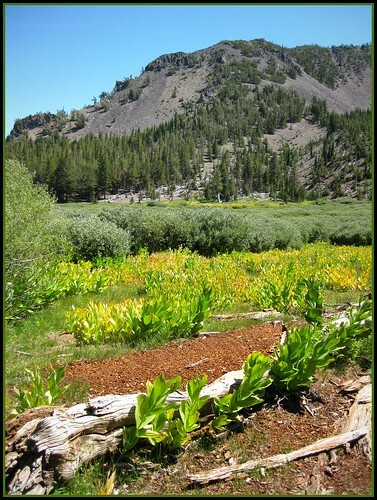 There is plenty of shade, and it’s a fast walk over to the meadow below Mount Rose. Near the end of this section is a nice waterfall at the beginning of the meadow, and it would be a good destination for those looking for a shorter hike. 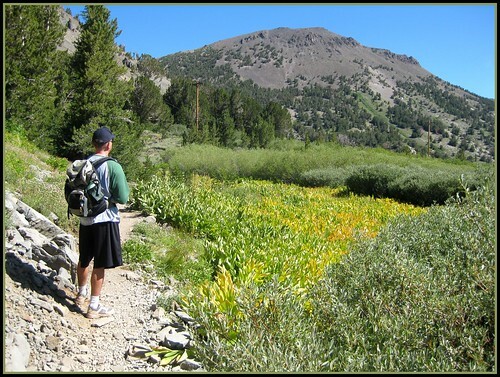 At the north end of the meadow, the new trail joins the old trail (that goes around the west side of Tamarack Peak). 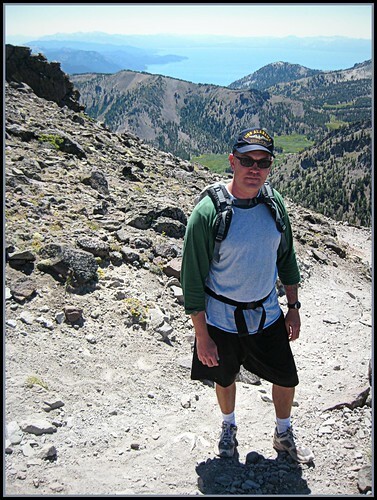 This is about the halfway point, and the easy part of the hike is behind you. There is nowhere to go from here but up! The second half is steep! 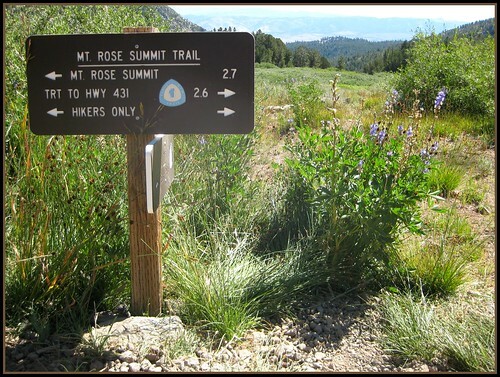 The second half of the trail begins by climbing straight up the canyon between Mount Rose and Mount Houghton. It’s steep all the way to the saddle, and can be slippery at times. Luckily this section is only about a mile and there is a great place to rest up on the saddle. It looks like a great place to camp up there too, provided you had enough water. 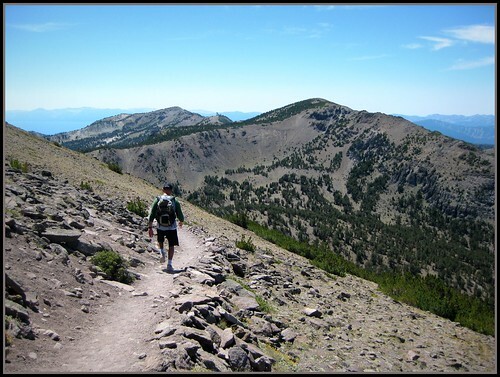 The trail leaves the saddle and heads east along a narrow ridge towards Mount Rose. Beautiful views can be had to the north and south. 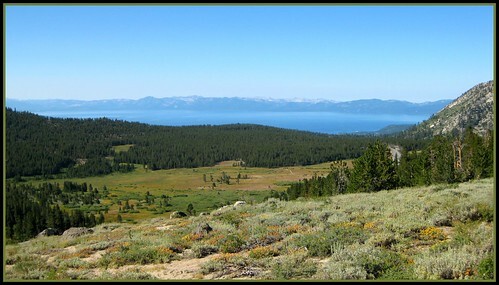 To the north you can see the reservoirs along the Interstate 80 corridor, and to the south you can see the Carson Range and Lake Tahoe. 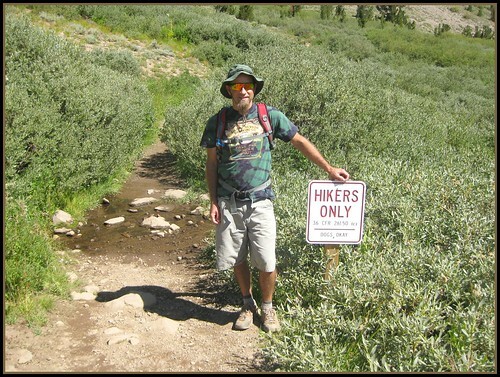 It was at about this time that James and I started catching up to many hikers that had started out before us, including many card carrying members of the AARP hiking with a ski pole in each hand. In fact, we were pretty surprised at all the people we saw out enjoying the trail that day. Due to the high elevation at this point, we stopped to talk to as many people as we could and took many pictures. I don’t think we went more than 50 steps at a time. 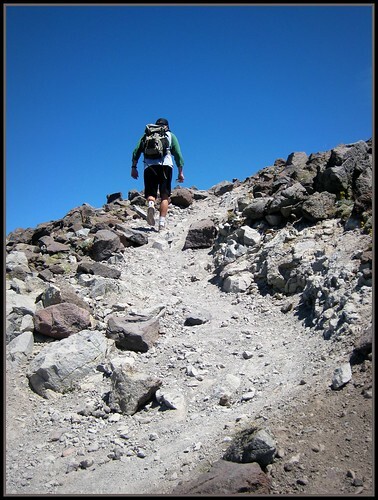 Once we got above Timberline, we seemed to get a second wind. I think we were excited because we were so close to the top. The trail was pretty steep in places, and the 360 views of the planet below let us know that we were really high up. We made the summit at 12:30, just in time for lunch. 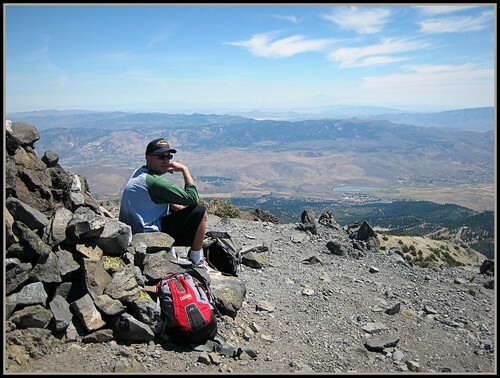 There were several people at the very top, so we hiked over to the south a bit to get better views of Washoe Valley. The wind can howl up on the peak, and there are rock shelters scattered around for people to huddle in. There was almost no wind that day though, so we just sat near one on the shelters and unpacked some food. The skies were a bit smoky, but we could still see a long ways. 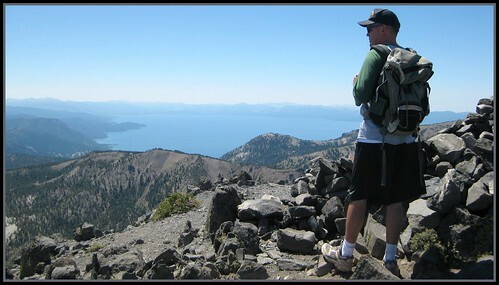 We could even make out the pyramid shape of Mount Lassen over 100 miles to the north! The Mount Rose Ski area was 1,000 feet below us. 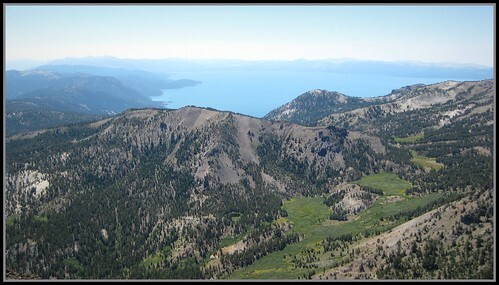 Lake Tahoe 4,451 feet below us. Donner Lake and Truckee, CA were visible off to the west. Less visible due to the haze was the Great Basin off to the east. After thoroughly enjoying a simple lunch and taking in the views, it was time to descend. I felt some blisters forming on my feet, and wondered how the descent would be. Thankfully, my knees didn’t hurt as bad as I thought they would on the way down. There seemed to be enough flat spots to give them a break. 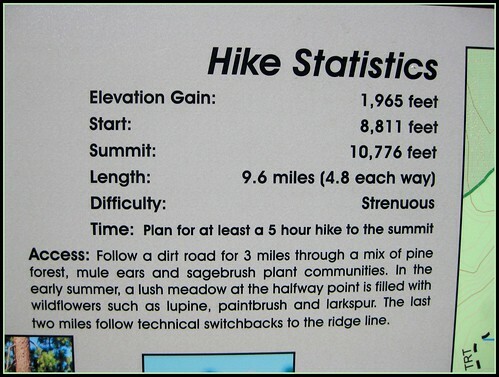 We made good time getting down to the meadow, and passed several more people on their way up to the summit. I was glad to be going down at this point, and was glad I was not them! Early starts are best in my opinion. Back to the easy half! 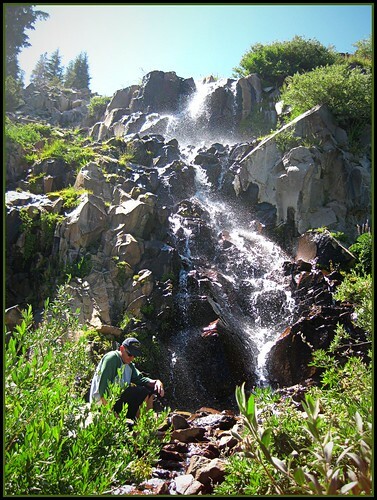 We decided to stop at the waterfall and take a final rest before hiking back to the trailhead. Going barefoot in the creek sounded like a splendid idea, but the water was so cold that we could only wade for a few seconds before the pain was unbearable! We just sat and enjoyed the sound of the waterfall instead. Once back in Reno, we stopped at Starbucks for a pick-me-up. Two grimy dudes in the midst of clean and well groomed folks, I wondered if we looked homeless. A couple of bums. We enjoyed coffee and donuts, and discussed our next adventure. Which mountain would we climb next? More pictures on Flickr HERE. I went through an 80 oz CamelBak and most of a 32 oz water bottle. Bring lots of Water! Lunch and snacks like Clif Bars. Sun hat and sun screen. You’ll get fried at 10,000 feet without sun protection. Wind/Rain Jacket. The weather can change quickly at the higher elevations. Be prepared. Good walking shoes. I failed in this area, and will be looking for better shoes. My insoles are worn out and caused a few blisters. 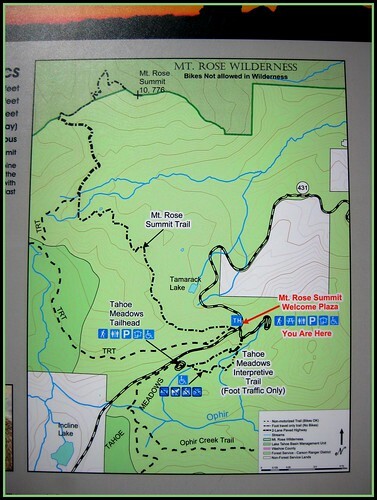 Maps are currently provided at the trailhead. Very nice. The facilities, maps, signs, etc. look like a great compliment to a nice trail and views. Kinda out of your league there, Jeff. 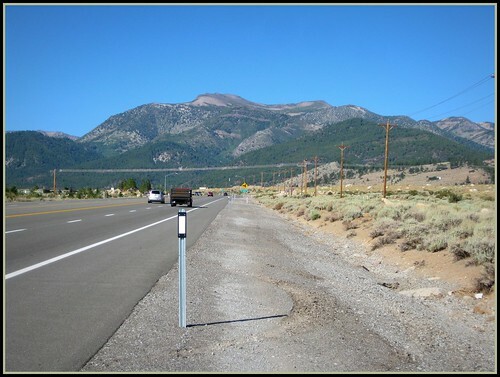 Leave the pedestrian issues to walkcarson.com or I will start a biking blog about carson city! That’s right, that is a threat. Great pictures and content, thanks. We need ot mix it up once in awhile. I enjoy hiking a lot more these days but I like there to be a lot of trees for shade this time of year. 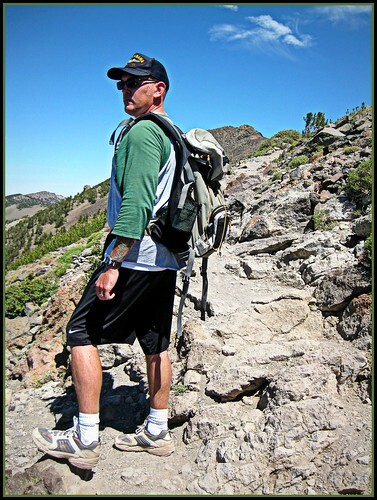 Hey Jeff – we are thinking about hiking Mt. Rose this Saturday and was wondering about taking the dog with us. Are they allowed and if so, is it even wise? Yeah, we saw lots of dogs up there. Take the dog if it has the stamina. Take plenty of water for the dog, as there is only water at the half way point. i don’t know why anyone would walk way up there. couldn’t you have just driven your car to the top? seems like it would have been a lot easier. and saved time too. watched some sports on the tv instead of worrying about water and food and the sun.